With the hosting feature you can serve your website (html, css, js, images) right from your Baqend cloud instance while using your own domain. Tip: Baqend hosting works great with static site generators like Jekyll, Hugo, Octopress, or Hexo. You can start completely static or even import data from CMS like Wordpres. Later you can gradually add dynamic parts using the Baqend SDK. From the first static blog post to a highly dynamic site, everything will be cached and accelerated by Baqend. To deploy your assets, you can either use the file explorer in the Baqend dashboard (e.g. drag and drop files and folders) or the Baqend CLI for an easy, automated deployment. Note: You should not use a top level domain as a CNAME, since many DNS providers do not support it. Instead use a sub domain such as www.yourdomain.com. In addition you should ensure that no other DNS-entry is set for the used domain. Log into your Baqend dashboard and open your app settings. In the Hosting section, simply add your custom domain www.yourdomain.com and click the save button. Your domain will now be registered at the CDN. Instead of <appName>.app.baqend.com you can now use www.yourdomain.com. Optionally, you can define a custom Domain root folder (default: www). This allows you to host multiple pages on the same Baqend app. Just specify a different file root folder and its content will be served by your custom domain. Consult your DNS provider's instructions to configure the CNAME record for your domain name. The steps to add a CNAME record will vary for each registrar's control panel interface. If you cannot find your provider's CNAME configuration instructions, Google maintains instructions for most major providers. Note: The registration of your domain as well as your DNS entry can take a few minutes until they are accessible. If you have trouble configuring your CNAME records, contact us at support@baqend.com. This is in order to make sure that ever entrypoint into the app uses the code from your index.html. If a user for example directly opens a URL like http://yourapp.com/products/42 this request needs to be handled by the single page app because there is no hosted HTML file under /www/products/42.html. The 404.html is returned whenever no hosted file is found for a URL (like http://yourapp.com/products/42). By hosting the same code in both your index.html and 404.html all entrypoints will be correctly handled. All data accessed over the Baqend SDK can be SSL-secured by enforcing encryption at connect. To enable SSL encryption for your hosted assets as well, generate and activate an SSL certificate for your custom domain. To this end, navigate to the "Hosting" section in the dashboard settings. This will queue your request for later activation. If you plan to request more than one SSL certificate, request all of them first and then activate them in one batch (see next step). You may activate several certificates at once, but you may only start 2 activation processes per day. By confirming the activation dialog, your SSL certificate will be activated. Your custom domain is now reachable via https://yourdomain.com. Behind the curtains, we are using Let's Encrypt to automate the entire process. It is quite common to protect QA or staging environments with Basic Authentication, also known as .htaccess protection. 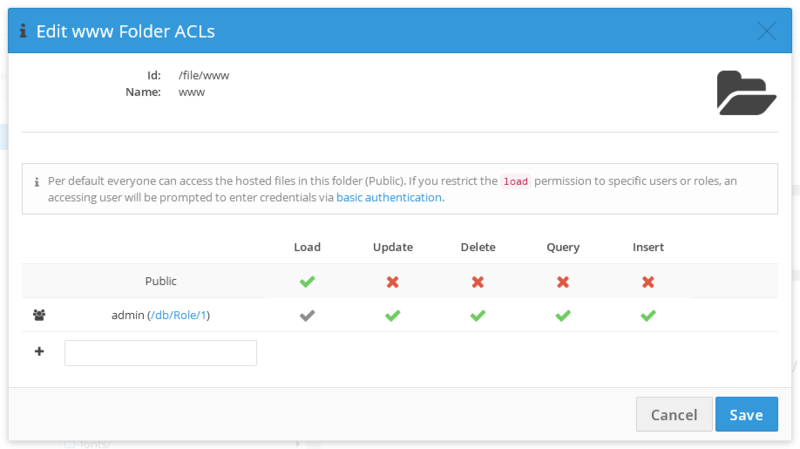 If you open the dashboard, navigate to files, and click the Edit Root Folder ACL button, you can restrict the load permission to specific roles and/or users. For example, if you assign the load permission to the loggedIn role, only logged-in users will be able to access content hosted in the corresponding directory. New Users can be created in the Dashboard Data > User table. Root-level permissions: Please note that you can only define permissions per root-level folder, i.e. at the granularity of the top level. Second-level (and below) folders inherit the permissions defined for their parents. Note: If you use the Baqend SDK on the protected page, any authorized user will also be loggedin in after the SDK's connect call. The certificates are deployed directly at the CDN which makes the initial handshake superfast. Once activated, your SSL certificates will be renewed automatically, so you don't have to maintain them yourself. HTTP/2 is activated by default to make your website as fast as possible.